The City of Melbourne has ordered the individual apartment owners collectively to replace the external cladding on the Lacrosse building which went up in flames in Docklands last year. After last year's event, where fire rapidly spread up the external walls, investigations were launched into the cladding material used. 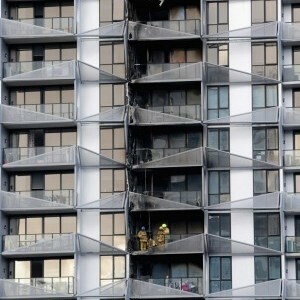 They found that it was non-compliant with the Building Code of Australia (BCA, because it was “not a non-combustible material”. The building order requires the 328 unit owners and the body corporate cover the costs for replacing the cladding with a solution which complies with the BCA; estimated to be up to $750 per sqm. The Municipal Building Surveyor had required owners demonstrate how the building would be brought into compliance, however has now concluded the responses failed to adequately address the issues raised. As a result, thr City of Melbourne issued a building order legally requiring work be undertaken within 350 days. The City provides further details on their website about the issue reasons for the decision. The local authorities report that the wall cladding in question, named 'Alucobest', is a lightweight, aluminium composite panel with polyethelene in its centre. It is not fire-rated and CSIRO testing has confirmed it to not be ‘non-combustible’ as required by the BCA. “It is not illegal, however, it is a product that cannot be used in all situations, or where the NCC requires the external wall component to be non-combustible,” they explain. The Victorian Building Authority is now investigating how it was approved for use, as well as who is responsible. The Authority is also auditing 170 building permits relating to building work on high-rise buildings in central Melbourne and immediate surrounding suburbs issued in the past 10 years and progressively publishing the results on their website. Non-compliant use of cladding has been identified on some buildings, and in those cases been referred to Municipal Building Surveyor to consider appropriate action.